During the first Mortal Kombat tournament Liu Kang satisfies such precise conditions that it forces the enigma that is Ermac out of hiding. Kronica steps out from behind the veil to show her disapproval at triggering such a discovery so early in the script. 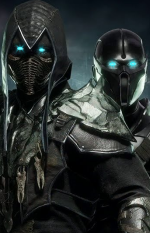 Having some fun and adding MK11's puppet master to the lore of MK1. Should've saved this for the contest. No, he should not have. This has minimal editing, and UR knows it. We've seen better from him. That is not to say I don't like what you did (except that fugly face). Ermac's stance is cool and I like the green blood you put on Reptile. UR, I challenge you to make Kronika into a 2D sprite (once we've actually seen her whole outfit, that is). While it is plain n simple, the nostalgia made me smile.